Here are our top picks for books series for 3 – 5 years old boys. As you may have figured out we are big fans of series and seek out books that are in as series so the goodness of the stories go on and on. Getting boys started in series is a wonderful way to ensure that they will want to keep reading. Sometimes it is hard to find a book that they really like. When you do and the book is over you are faced with “now what?” Book series solve that problem for you – well, at least until you get to the end! 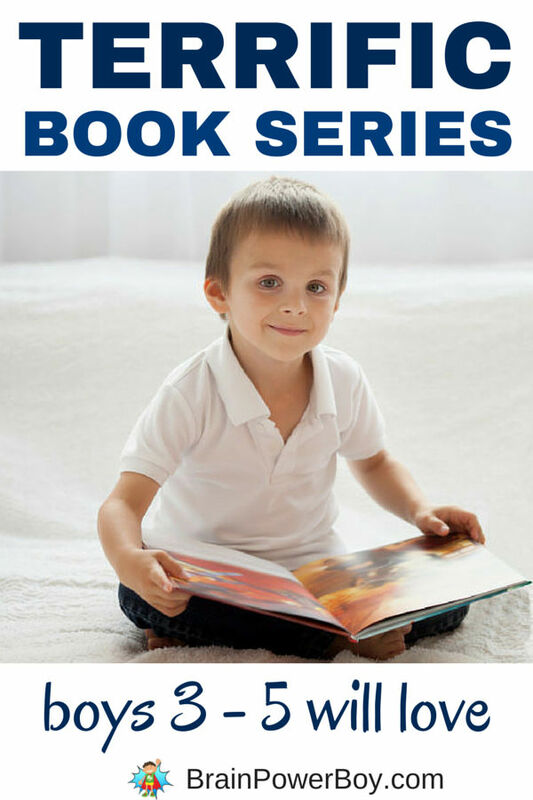 We are all about finding the very best book series for boys and all of these books are great for boys 3 – 5. They are super for reading aloud and for boys who are reading on their own. Don’t miss our highly recommended selection. It is so good. “He was a good little monkey and always very curious.” How many times have you read that line? In the first book you learn how George was captured and get to follow along as he begins his life with The Man with the Yellow Hat. Curious George is always a winner with boys. They love that he is curious and that he is a bit of a rascal as well. Start them on this wonderful series early. There are 59 great titles to read. When this book came out it was met with astonishment and glee. Today I Will Fly! (Elephant and Piggie series) begins this series with Piggie who is obviously a pig and Gerard who is an elephant. Piggie wants to fly. Gerard, always the more practical of the two, says that is not going to happen. These stories are funny, enjoyable and touch on friendship and emotions in a way boys will be able to relate to. There are now 24 books in the series. In order to read the original Thomas the Tank Engine (The Railway Series) stories, your best bet is to get this treasury: Thomas the Tank Engine Story Collection. It has all of the Railway books starting with The Three Railway Engines, and moving on to Thomas the Tank Engine, James the Red Engine, Henry, Gordon, Toby, Edward, Percy and the rest of the gang. In addition to the book above, we enjoyed this series about Thomas the Tank Engine and Friends (Thomas and Friends series.) There are newer titles available but really, we don’t think they are as good. You won’t go wrong with these. Click the pictures to see them. If you have a boy with a BIG imagination or want to encourage imaginary play (and you totally should!) you need to get the Skippyjon Jones (Skippyjon Jones series) books. These were a bit hit with many boys. Big Hit! Skippy Jon Jones is a kitty. Hmm. But he is no ordinary kitty for he is the great El Skippito the sword fighter. Really! His adventures are crazy and his closet? Oh yes, his closet is a magical place indeed. I love the illustrations with their saturated colors. 8+ books in the series. If you have not given Pete the Cat: I Love My White Shoes (Pete the Cat series) a try yet, you should consider doing so. Bright amusing illustrations pair nicely with the upbeat story of Pete who loves his white shoes. Then he walks in blueberries and strawberries and his shoes are no longer white! Great for colors and keeping an upbeat attitude. The Pete the Cat books keep coming. 6+ books in the series. I have always enjoyed Cynthia Rylant’s books (see another of her series in books series for boys 5-7) The book Mr. Putter & Tabby Pour the Tea (Mr. Putter and Tabby series) is about a rather lonely older man who needs a companion to help him enjoy his days. He seeks out and finds Tabby, a rather older cat who is the perfect match for Mr. Putter (love the name!) They enjoy life in a slow paced and simple way and that is what I love about these books and yet she makes these books amusing and very fun to read too. Later in the series we meet Mrs. Teaberry and her dog Zeke. She is a bit unconventional and they make the series all the more enjoyable. 21 books and counting. I want you to know that I am in love with these books. When I first picked them up for my son many years ago I thought they were wonderful. The illustrations are so different and the stories, so full of imagination and wonder, were just what I was looking for. Henry the Explorer features Henry (but you knew that, right?) and his dog Angus. Henry and Angus are off to make their mark on the world by going exploring after a blizzard. They take their explorer kits which, of course, include flags to mark where they have been and set off. One of the things I love is that Henry reads books that lead to him having wonderful adventures. Yes, they are very different than modern books like Elephant and Piggie or Skippy Jon Jones. They are unique and delightful. Seek them out! There are only 4 books in this series; we really wish there were more. Highly Recommended! I went backwards for a change as I do much more for the young boys than I do for teens. Hope you found some new series to enjoy. Oh my, so many memories. I think my boys were into all of those between the two of them. Curious George and Thomas for sure for both of them, and my youngest still likes to pick up Pete the Cat occasionally. Saving this for gift ideas for my nephew, I’m sure he’ll love these too. Hi Alli, I know what you mean. It was a walk down memory lane for me as well. Thanks for saving the list for gift ideas – I appreciate that. Oh I love this! Found your post on the Friday Family Fun Link Party and so glad I did! My son is only a year old but already loving books. I need to keep all these in mind as he gets older. Thanks for the great list. Thanks Cate, it was a lovely look back to go over the books my son used to love. Curious George and Thomas were certainly tops in our house too. Enjoy! I love these books! My son turns 3 the beginning December and hope we have some because he hasn’t been that into books. We need some help. I’m so glad to hear you like the list. I hope your son finds a few books that he enjoys. If you need help with anything just let me know through this form: Contact me.